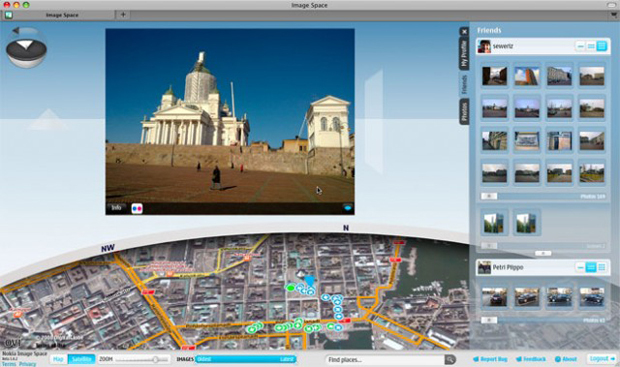 With the help of Nokia Image Space you can easily create your own 3D presentations of the places you have visited (a feature quite reminiscent of Bing Maps’ Photosynth). The only things you need here are your trustworthy Symbian-powered Nokia smartphone with GPS receiver and compass aboard. Oh, that and a Flickr account. Using the GPS the phone will record the coordinates of the place where the image was taken while the digital compass will record your orientation. Then you upload that metadata-heavy image with the mobile Nokia Share Online client. And if there are enough photos taken in a certain area, the magic will happen: Image Space generates a 3D presentation using your photos. To view it, you need to have the Nokia Image Space browser installed on your desktop computer (of course, a laptop will do too, but not your phone). Keep in mind that the Nokia Image Space is an experimental research project by Nokia Research Center and there is still some work to be done before the service starts working trouble-free. Using Nokia Image Space you can also share your images with all of your Flickr contacts directly from your mobile phone. You are also able to leave comments, edit tags and photo descriptions, again, without using a computer. The applications has been tested on a wide range of devices such as Nokia N97 mini, Nokia 6210 Navigator, Nokia 6710 Navigator, Nokia 6720 Classic but is expected to work on many more phones powered by S60 (3.2 or 5.0), which also have an built-in compass. There are some issues discovered (for example Nokia N97 has some sensor issues with the Image Space Capture app) and probably others waiting to be found, so if you discover more problems while testing the application, feel free to share them with us in the comments section.